Start your morning with a hearty and filling meal! 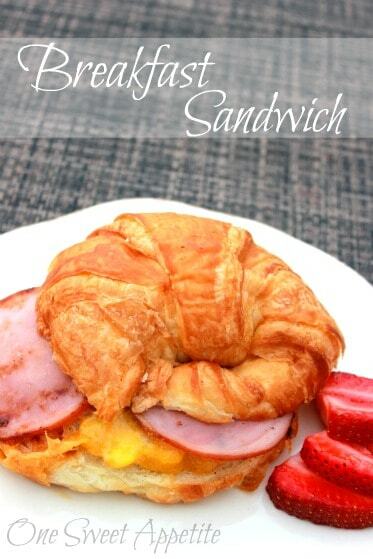 This camping breakfast sandwich is ridiculously easy and can be made before you leave! 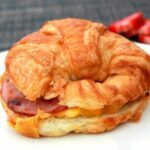 Breakfast sandwiches are high on our favorite breakfast recipe. Truth is my seven year old has voted (on more than one occasion) that my husband knocks the easy recipe out of the park, while mine are slightly less appealing. I don’t know what it is that he does differently but they always taste just a little bit better. Maybe it is because I am not the one doing the cooking? 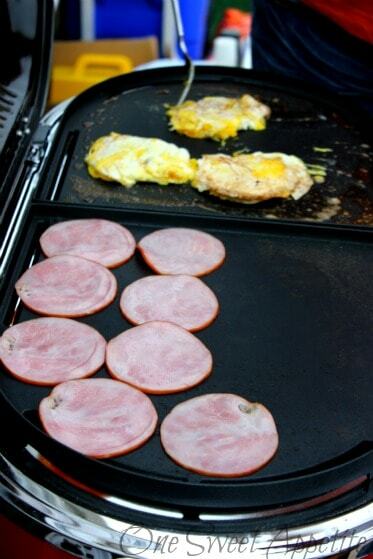 Either way, this super simple meal wins as our #1 favorite camping breakfast recipe! What is a good breakfast for camping? Chop, slice, and dice all of your ingredients in advance. 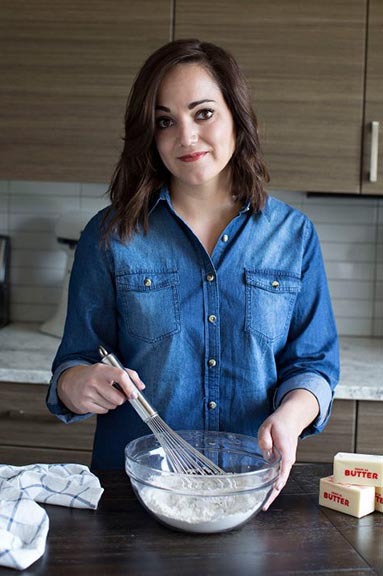 This is incredibly handy with this recipe. Cook anything you can before you leave. Make ahead meals are fantastic. Take full advantage of them! Tin foil is your best friend. Not only can you cook most of your meals in it, but it serves as a plate and makes clean up a breeze! How do you freeze breakfast sandwiches? This is one of my favorite tips, and something I tell everyone to do! Make these ahead of time and FREEZE THEM! There are two ways you can freeze these sandwiches. You will want to make and assemble the sandwiches. Wrap each sandwich individually in heavy duty foil. When you are ready to eat just heat them through on a grill or coals, making sure to turn frequently. Make and assemble your sandwiches. Wrap each individually in plastic wrap and place in a labeled zip top bag. When you are ready to eat remove the plastic wrap, wrap in a damp paper towel, and microwave for 1-2 minutes or until heated through. slice your croissants in half and spread with butter. Set aside. Crack the eggs onto a preheated cooking surface. Season to taste with salt and pepper. Cook for 1-2 minutes and flip. Place one slice of cheese on each egg and allow to melt while it finishes cooking on the second side. Place your chosen meat onto the grill to heat. Place the sliced croissants cut side down to toast. Build your sandwich and serve. Follow the instructions above, cooking on a stove top. Place assembled sandwiches onto a square of foil. Wrap tightly and freeze. At the campsite: Heat the sandwiches until warm throughout on hot coals or a grill. Serve immediately. We’ve done this while camping with bagels and added tomato slices. It was delicious! i really like this idea! how do you keep the eggs and meat cold while you’re camping, especially for multiple days in a row? We stuck them in a cooler with LOTS of ice packs, and made these the first morning. Our cooler actually stayed pretty cold the entire trip, but we always try to eat stuff like this right away. With many years of camping under my belt (40+) I would like to share a secret to keeping things cold or frozen in your cooler… first, make sure you have a well insulated cooler.. No styrofoam. I have an old, old Coleman Refrigerator and a newer cooler.. both work well. Second, you will need 4-6 heavy duty paper bags ( the heavier the better) Paper is an natural insulator and this will create an ic box within and icebox..
To start fold up the bottom of the paper bag and lay them flat next to each other in the bottom of the cooler.. Next, I put all of my frozen items on one side of my cooler stacking them to about mid way up the cooler. (See note) Next, put flat cooler packs in the bottom of the other side and stack other refrigerated stuff like condiments, butter, milk, cheese etc. on the other side and on top of frozen food. Remember, the fuller the cooler the colder it stays. After you have everything in there. including the kitchen sink.. lol!! Place more cooler packs top of everything and add another layer of paper bags and you are ready to close the lid andgo. I use my second cooler for perishable veggies and fruit. Prepare the second cooler the same way but I place the large ice packs into the unfolded part of the bag at the bottom so the food doesn’t sit directly on the ice pack.. Do the same at the top . I know this sounds complicated but it really isn’t. :Note: When I camp I bring alot of my meals already prepared and frozen (ie: barbequed chicken & pork, lasagna in foil pan, cooked ground beef or turkey, etc.) so I just defrost what I am going to make that day… the less you open your cooler the longer it stays cold.. I have had things stay frozen for days with this method..
We LOVE egg sandwiches!!! I like mine with bacon!! My husband likes his with sausage. I always precook my bacon so it’s fast and not so messy! 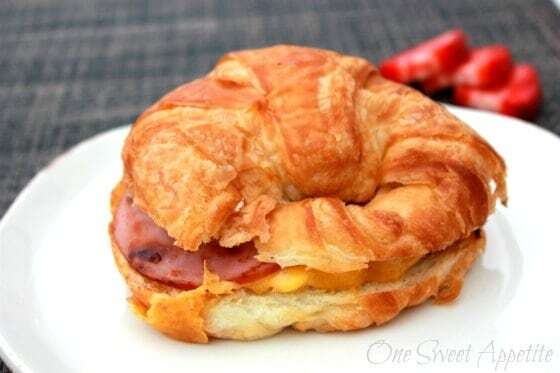 I love the croissant idea! Definitely trying this next time we camp! Going camping this weekend! This is perfect. Thanks! Make these ahead and freeze. Scramble your eggs and fry the meat of choice, then assemble. To help crisp up the croissants, brush on some melted butter to the outside of croissants. Then wrap in foil and place in freezer bags and freeze. Toast on the grill or right on some coals for about 15 to 20 minutes, depending on heat level and whether the sandwiches are thawed. Easy peasy breakfast. Make your coffee the night before and put in a thermos and have it ready to go first thing in the morning.